The altar of the Holy Cross is located near the sanctuary and was madę by Johann Riedel SJ (1654-1736). The antependium is richly decorated with bas-reliefs with image of the copper-head serpent – a rescue from deadly bite. The image of the bronze serpent was placed on a pole as ordered by Lord in order to save the Israelites Lb 21.9. It served as a pre-figure of the Crucified Saviour, who saved the world from eternal death. The predella is decorated with a bas-relief “the Lamentation of Christ after descent from the Cross” as well as the anointing of the Divine Body with precious oils. The panels of the base of the altar arę decorated with imag-ery of Christs Passion: bridgc on Cedronie commemorating the passage of Jesus with his disciples over the brook on the way to the Garden of Olives; the pieces of silver that Judas receivcd for betraying Jesus; St. Peter’s sword with the ear of Malchus standing at the front of the imperiał guard sent to capture Jesus upon Judas’ betrayal of Jesus. St. Peter drew out his sword to defend Jesus and cut off Malchus right ear. Nevertheless, Jesus stopped him and miraculously miracle healed the ear- last miracle before the Crucifixion. Jug of water which Pilate used to wash off his hands after the conviction of Jesus, the glove with which the servant of the high priest struck Jesus in the face, flag-ellation column, a basket with instruments used in the Passion of Christ, a cane which was given to Jesus as the scepter after the scourging, symbol of internal obedience of Jesus. Rooster which crowed when St. Peter denied Jesus is a symbol of Christs victory over darkness of the night. Yeraikon, a veil of St. Yeronica which she used to wipe the face of Jesus who was carrying His cross to Golgotha. The reredos of the altar is decoratively framed. The motif of laurel leaves appearing on the frame is a symbol of glory and victory of saints who endured persecution. 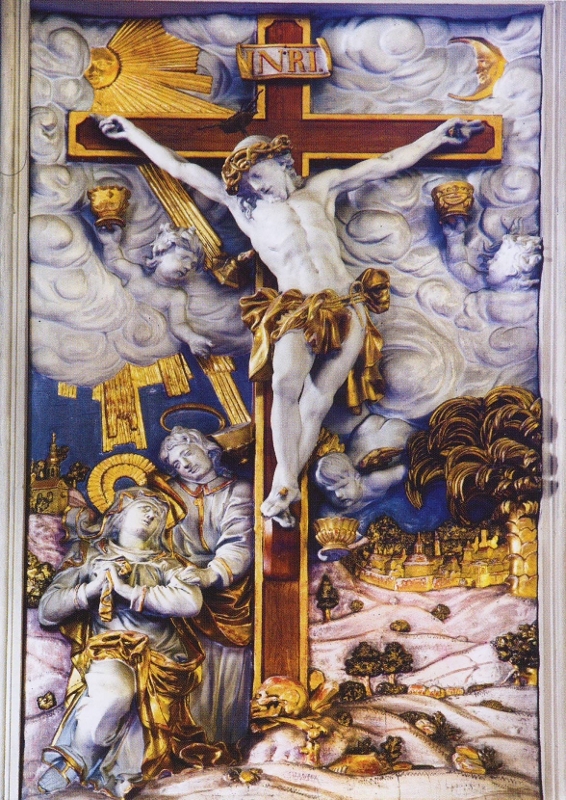 The altarpiece is decorated with the Crucifixion of Christ with clouds in the background. Notę a skuli at the foot of the cross, a reference to the bclief that the cross of Christ was placed on the grave of Adam. The cross is the gate to heaven and the key to paradise. 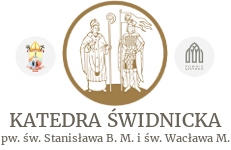 Over the right arm of the crfiss, there is the suń and over the left – the moon, symbolizing the Church of the Old and New Covenant. Just as the suń and the moon arę two large lights in the firmament of heaven, so arę Christ and the Church. Angels arę holding golden chalices at the wounds of Jesus. The hills offers a panorama of Jerusalem and at its walls, then tree, symbol of justice, victory and peace. Under the ci in despair Our Lady. Behind her stands St. John. The altar is flanked by łonie columns. In the triar iment is displayed shroud which was wrapped round l Jesus in the tomb. In the crowning – an allegory of mei as a reminder of the great act of love of Jesus to the peoples. Crucifixion is the most important Christian image. Christ death on the wood of the cross bearing the greatest sacrifice for sinners.